Field Sobriety Test: What If You Refuse to Take One? What If You Refuse a Field Sobriety Test? Home / The Consequences of a DUI / What If You Refuse a Field Sobriety Test? The content of this article is not designed to substitute for professional legal advice. It is designed to be used for educational purposes. Anyone who needs legal advice should consult with a licensed attorney. A field sobriety test is a test used by police officers when a person is suspected of driving under the influence of alcohol or drugs. The test is given after the police officer has stopped the person in an effort to determine whether the person is a risk on the road. The United States National Highway Traffic Safety Administration (NHTSA) began researching these tests in the 1970s to determine which tests would provide the most utility for recognizing people who are legally intoxicated in the field. In the 1980s, police officers began to use the organization’s battery of standardized field sobriety tests to make decisions on whether to arrest drivers who were suspected of impairment due to drugs or alcohol. The tests were originally designed to indicate intoxication levels in individuals associated with a blood alcohol concentration of 0.10%, but now, they are standardized to detect the types of deficits that occur in individuals with a BAC of 0.08% (the national standard of legal intoxication). A standardized test is one that has the exact same questions or tasks, administration procedures, and scoring procedures for everyone who takes it. NHTSA defines three specific parts of the standardized field sobriety tests. The eye cannot follow the moving object in a smooth fashion. The jerking begins prior to the eye being 45 degrees of center. These tests are believed to measure the type of divided attention that individuals use when driving an automobile. According to NHTSA, research studies have indicated that the HGN test correctly classifies 88% of individuals as being intoxicated when it is failed; the walk-and-turn test correctly classifies 79% of individuals as being intoxicated; and the one-leg stand test correctly classifies 83% of individuals as being legally intoxicated. A person who fails all three tests is very likely to be legally intoxicated. Of course, some situational factors can invalidate the use of these tests, such as a person who is on certain types of medications, who has neurological issues such as seizures, or who has physical disabilities that interfere with their ability to maintain their balance. NHTSA cites numerous legal statutes that attest to the legal admissibility of the standardized field sobriety test results. Attorneys attempt to challenge the validity of the tests in court by deeming that officers deviated from the standard procedure, or they were not qualified to administer the tests. Thus, in most jurisdictions, officers are trained and certified in the use of these tests. In addition to the standardized field sobriety tests, officers may use other tests in the field to determine if an individual might be intoxicated, such as counting backwards from 100, reciting the alphabet backwards, walking in a straight line, etc. Are Field Sobriety Tests Objective? 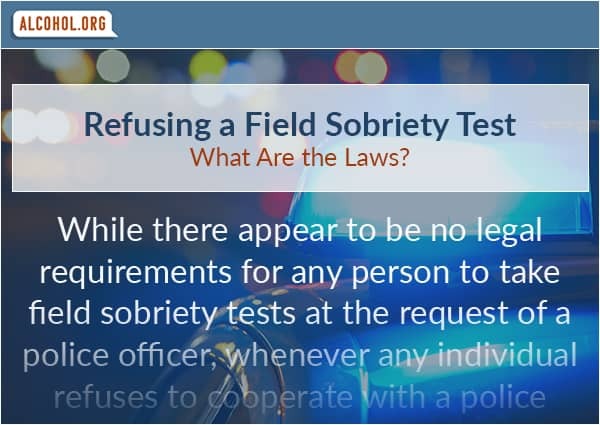 There are several reasons why standardized field sobriety tests or any other field sobriety tests that a police officer administers to a person prior to arresting them are not objective tests. First, as mentioned above, these tests are believed to be able to classify the majority of individuals who fail them as being potentially legally intoxicated, but there are numerous other reasons why an individual might fail one or more of these tests. Second, even though the tests are designed to be standardized, such that they are administered in the same way to everyone and scored the exact same way by the police officer, there is little evidence that this actually occurs in practice. The only way tests would be standardized is if the police actually read the instructions to the test out loud to the person in the field every single time they administered the test, and then had a formalized scoring guide to follow as they observed the person (as standardized IQ tests are administered and scored). This does not happen in actual practice, and attorneys will often attempt to demonstrate in court that the officer broke with the standardization process, thereby invalidating the test. Finally, most legal sources agree that when an officer stops an individual for suspected driving under the influence of alcohol, or some other alcohol-related offense when the person is driving, in the vast majority of cases, the officer has already decided that the person is impaired and is going to arrest them. The field sobriety test is just used to help the officer to establish in court that there was probable cause to stop the person. The test is not an objective measure of an individual’s BAC; therefore, even though the officer will use the information from the tests in court, field sobriety tests are not objective measures of legal intoxication. Can Someone Refuse a Field Sobriety Test? Individuals can refuse to take field sobriety tests. There are pros and cons to doing so. When a person is stopped for suspected intoxicated driving, the police officer will often try to convince them to comply with the request for field sobriety tests. Remember that the police officer is attempting to establish probable cause for stopping the person and evidence that the person was intoxicated. They are simply building a case to arrest the individual. In most cases, after the police officer has stopped someone who they suspect of being legally intoxicated, the police officer will most likely arrest the person anyway and perform further tests at the police station. These tests are designed in a manner that results in any performance that is not perfect being scored as a failure. In addition, if the officer suspects that the person is legally intoxicated and the person passes the standard field sobriety tests, the officer has the option to arrest them anyway if they suspect the person is unfit to drive, or the officer will most likely request that the person take a roadside breathalyzer test. These tests are used by the police officer as evidence that there was probable cause to stop the person. When police officers arrest anyone, they believe they have probable cause to do so. While there appear to be no legal requirements for any person to take field sobriety tests at the request of a police officer, whenever any individual refuses to cooperate with a police officer’s requests, this typically leads the officer to believe that the person is trying to hide something. Refusing field sobriety tests will most likely result in the person being arrested. If an individual passes the field sobriety tests, and does not register as legally intoxicated on a roadside breathalyzer test, the officer can still arrest the person if the officer suspects they are a danger to others. However, if the person passes these tests, attorneys can suggest to a judge that there was not probable cause to stop and arrest them. Because even the use of mild to moderate amounts of alcohol can affect a person’s judgment, individuals who are stopped after they have used alcohol are often more confident in their abilities to drive and pass sobriety tests than they should be. Even very mild amounts of alcohol in an individual’s system can affect their performance on a number of tasks that require divided attention, such as driving and completing field sobriety tests. Unless the person is absolutely sure they have only consumed one alcoholic beverage per hour or less, it is very likely they will provide some evidence to the police officer that they are intoxicated to the point of being unable to drive safely. If an individual refuses to take field sobriety tests that are requested by a police officer, it is important for that person to avoid aggravating the situation further. Be polite (but not overly polite), respectful, and simply decline to take the field sobriety test. It is important not to worsen the situation and give the officer any additional reason for arrest or to add on other charges. Again, always consult with an attorney regarding the actions to take in any situation where you have been detained by a police officer. It is important to know and understand your rights before any legal entanglements occur.